We realize each patient has a different set of visual demands as a part of their daily routine, and we gear each exam toward the patient’s lifestyle needs, both professionally and recreationally. We want all of our patients to feel at home in the practice, but know that their vision needs and, most importantly, their eye health, is of our utmost concern. Whether you’re looking for the latest trends in eyewear, or the mainstays in fashion, we have a wide array to choose from. Dr. Penney is especially comfortable with helping patients who now need help with their near vision, and often accomplishes this with contact lenses. Our practice prides itself on providing a very comprehensive, thorough eye exam at each visit to patients of all ages. 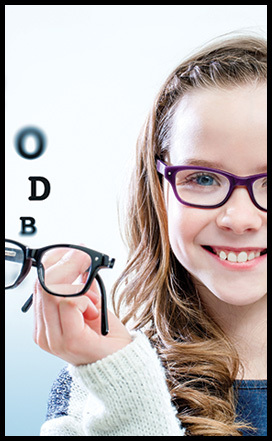 Dr. Penney and staff provide eye care to the entire family, starting as young as 6 months of age. From the minute the patient walks in the door, they should feel at ease that all their concerns will be addressed, in a professional, inviting, comfortable environment. Patients should come to the practice for all their needs, whether it be to have the latest fashion in eyewear, have their child’s eyes checked, be fit with specialty contact lenses, diagnose and treat red, painful eyes, or manage their glaucoma. We want you to leave feeling that you had the most thorough eye exam by a doctor and staff who truly want what’s best for your eye health, vision and appearance. *Dates vary, call to schedule. Dr. Penney’s staff treats patients in the Mon-Yough corridor, including White Oak, Elizabeth, McKeesport, North Huntingdon, West Mifflin, and the surrounding areas. Contact us today to make your appointment for professional, compassionate vision care for you and your family.